In March, 5 Participants and 1 Planning Team member representing The Boys’ Brigade travelled to Kirkkonummi in Finland for this year’s Easter Course looking at how to cross Barriers and Borders through Youth Work in Europe. “The Easter Course in Finland has been an outstanding experience, for the likes of myself where this was a major step out of my comfort zone, having only been abroad once, and never having boarded a plane, this has been a major experience for me. The course itself was packed full of activities relevant to the theme, including activities about discrimination, how to identify it, how to prevent it and the inclusion of minorities into our respective organisations. The activities were fun and informative, and have given me great insight and how to apply it to my work within The Boys Brigade, as well as giving me new ideas in ways to change and make improvements within my local area. In every way I feel a reinvigorated spirit of commitment towards the Brigade and its members thanks to this course. 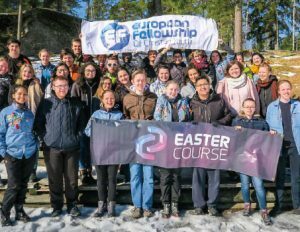 "I had an incredible week in Finland as part of the Easter Course and have made lots of friends with other young leaders from all across Europe. All the teaching was engaging and I learnt much about other cultures including different ways of prayer/reflection. We had many laughs and countless memories were made that will stay with me forever. It was one of the best weeks of my life." If you are aged 18-25 and would like to take part in Easter Course 2019 then email v.staples@boys-brigade.org.uk for more details and look out for further information in the next Gazette.